– and most important, it allows you to do it in Batch Mode! AMT is THE Batch Movie ScreenCap Creator! The AMT – Auto-Movie-Thumbnailer is an automation GUI to batch create ScreenCaps, Thumbnail Index Pictures, Preview Pictures or Contact Sheets for any given number of movies. It supports many different input (AVI, MPG, Quicktime, Real-Media, Windows-Media,….) formats, in fact every input format that is supported by MPlayer. 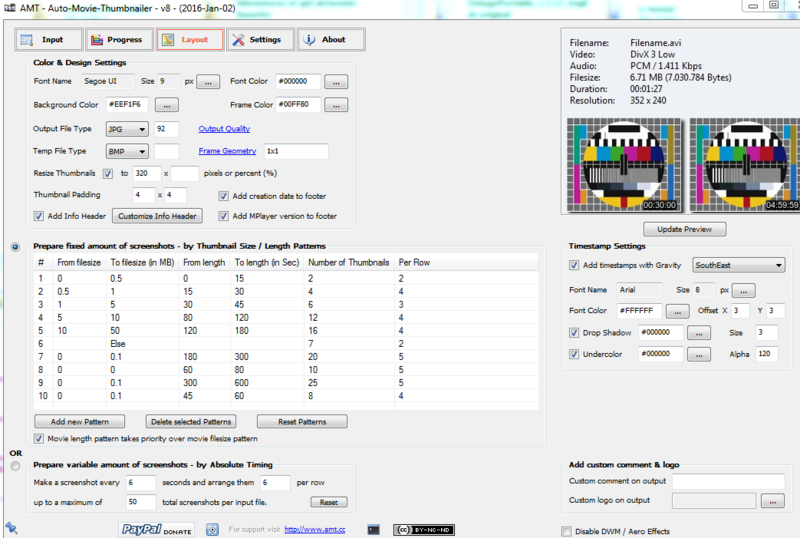 Additionally AMT offers you a huge number of possibilities to customize the design and layout of the ScreenCaps. AMT works by remotely controlling the MPlayer, some applications of the ImageMagick Suite and a MediaInfo plugin to perform the screenshoting and Picture creation. Short movies might not have enough key-frames (depending on format) for multiple screenshots. E.g. if you want to have 20 screenshots per movie, but the movie only has 10 Key-frames, will get duplicate screenshots. That’s because the seek function of MPlayer is controlled by simple math. 20 screenshots means start at 2.5%, next shot 7.5%, 12.5%… if now too few key-frames are defined in the movie (during creation process), 7.5% and 12.5% might point to the same key-frame, if for example the movie has a key-frame at 5% and the next at 15%. MPlayer is only capable of seeking key-frames for certain formats. See also http://creativecommons.org/licenses/by-nc-nd/3.0 for details. For any form of distribution of this software a link back to the authors website at http://www.amt.cc is required. It works fine on the XP-SP3-32bit, Win7-64bit and Win8-64bit machines I’ve tested it on. If you find bugs please let me know. The ImageMagick license is compatible with the GPL. A copy of the license agreements for these programs can be found in the respective installation folder. The AMT license does not cover these programs. All copyrights remain with the respective authors. All of the deliverable code in SQLite has been dedicated to the public domain by the authors and does not require a license. Hello Kafu, thanks for your software. I was looking at something like this for years 🙂 I have many videos which i would rather store as thumbnails instead of the original file to increase the HDD space 🙂 I would like to know if there is an option to take the screenshot with the subtitle (from a MKV file, for instance) in it. Thanks! When I find some time I’ll try to take a look. Maybe download SMPlayer and look at the “MPlayer Protocol” to find the correct switches. Luckily I have not been able to reproduce those bugs, which is a good thing 🙂 Right now, AMT is thumbnailing like crazy, and i have been able to minimize it to tray while it’s running (animated tray icons too, by the way ! ), and even cycle beetween multiple worspaces with no issue. That’s the best of both world. Thank you KaFu ! Now that’s good to know, thanks for the feedback, and also for your generous donation :)! I have trouble creating thumbnails + screenshots with the tool. Thumbnails I can do without trouble – but the equation get’s harder when I try to make certain number of screenshots (that are not the same pics as in created thumbs). Please help! I thought it would be great to have options to create certain number of screenshots with different diacritics than thumbs – but seems it’s not possible. a) First create standard thumbnails. b) Then change processing mode to e.g. 4) on the “Settings” tab, and on the “Layout” tab change the “Number of Thumbnails” in die “Prepare fixed amount” listview. Upon reading over this again, I realized I made some mistakes in my original description about what patterns were triggered. The imgur link is correct though. I have additional test data to report for previous example 2. Notice how example 2 for the imgur link doesn’t have any Else Patterns at the very end? Well I noticed that when I restarted the program, an Else pattern gets added if there’s not one at the end. So even if the last pattern has custom rules, it will get completely overridden by an Else Pattern once you restart the program. If there are multiple Else patterns created by the program AND none of the other pattern’s conditions were matched, then the very last Else pattern will be executed. Hope this makes testing a bit easier on your part. Thanks for reporting the update :). I did some rework on the layout mask. Now the “Else” should always be the last entry and you can add new patterns at the selected position in the overview. I’ll update the article above later today, for now here’s the download link to AMT v9. I have several Else patterns in this image. When I select the pattern to delete that pattern, it’s unable to be removed. If I exit the program and come back, sometimes an Else pattern is added. This can lead to large amounts of undeletable Else patterns. I know that you can reset patterns, but this may be an issue something that you’re unaware of. 2: Got a request for the “add new pattern” functionality. Is there a way to insert a new pattern into certain lines? I want to insert my patterns BEFORE the else statement. The way it is now, any new patterns I add will be added after the else statement. As an example, I want make any video that exceeds 600 seconds to have 7 thumbnails (2 per row). My video file is 609 seconds long and 389 MB in file size. “Movie length pattern takes priority over movie filesize pattern” is checked. The result of adding a 609 second length video is that I get 8 thumbnails (2 per row), which is pattern #10. I’m guessing it falls back to using filesize patterns. The way it is now, I have to explicitly state any patterns that I want to match. I’m trying to trigger the else statement, but I can’t reach it. Since my video file’s size is 389 MB and it’s 609 seconds long, I wouldn’t expect it to trigger Pattern #8. If anything, I’d expect it to trigger Pattern #6. One solution to this would be to append the Else statement at the very end, to let the user insert patterns in between line numbers, or to let the user rearrange the patterns up or down. As a side effect, letting the user move their patterns around would also make the patterns easier to read. TL;DR Else statement doesn’t work if you add new patterns. I’ll like to move the patterns around so that the Else statement is on the bottom. Thanks for this detailed feedback! I’ll definitively analyze it and fix it and will respond later. how can i fix aspect ratio with 1440×1080 videos? Under “Settings” there are the MPlayer Optional Arguments. Take a look at the MPlayer Manual, esp. on the options “-aspect ” and “-noaspect”, and try to add those to the optional Arguments. Is there a basic tutorial on how to use the program or something? No, sorry, no tutorial available at all :). The default settings should work fine, from there try to change one thing after another and observe the changes. Per default the screencaps are created in the input file folders, directly beside the input files. And every 1 second a cap? Maybe the resulting data volume is too big? Temp files are per default BMPs (huge), and too much caps might choke your system / ImageMagick. Also check the “Enable Log Display” at the right side of the GUI to see what’s happening. Not that easy, sorry :). MPlayer should use multiple cores, about ImageMagick I’m not sure, I think there’s no portable multi-core install. AMT itself is coded in AutoIt, which by itself does not support multi-core. Let AMT run in the background overnight, no need for such a hurry :). Good to hear that work-around worked for you, thanks for reporting :)! I’ve been looking for a program like this for ages. It will be an extreme help with setting up my home video collection. One thing I do have a problem with is the fact that all my videos are on a NAS drive. I have a mapped network drive (Windows 10) on my laptop however AMT does not see the mapped network drives at all. I have tried checking and unchecking the “Network Drives” checkbox but it makes no difference at all. It would be great if I can use a network drive as I really can’t bring 1TB of home videos to my laptop for screen caps. Also starting AMT “As Administrator” (right click) might work, though I did not test that. Is there any plan to release this for Ubuntu? Glad you like it :). No, I won’t release this for Linux, maybe give https://www.winehq.org/ a try? I’m curious too, if that would work. Hello, thank you for your program! Is there an option to pad the auto number at the end of individual screen caps with zeroes? Like “capture001” instead of “capture1”. My image program sorts them in a way that “capture1” will be followed by “capture10”, “capture11”, etc. instead of “capture2”, “capture3”. With the zeroes in front it lists fine. glad you like AMT :). Go to “Settings” > “Processing Mode” and check “Format Frame Digits”, that should do the trick. Thanks For Providing Free. Can I Capture My Videos One By One Picture. Its Capturing all in one ? – On the “Input” tab check “Create Single Frame Screenshots” and then select “2) Create multiple…” to create them manually. I really like this program and use it in windows. I’m trying to install it on my Linux box with Wine and I’m wondering what the system requirements are to run your app are. What windows components is it expecting to have installed? I’ve tried other apps on Linux for thumb-nailing and no gui that I have found comes close to what you have created here. Kudos to you. it’s bloated, buggy (constantly crashes). A more detailed report might enable me to fix what you’re talking about. You my friend… are the BEST! you just made my day! i do not know what happens in the startup screen (if you can please make this faster :):) ).. but the milliseconds delay are nothing compare to the time that i will save when i integrate this in my automated batch!! Glad you like it :). During start-up the program is prepared, DB is opened, folder structure for treeview is created, that just takes some time. If you use it in batch, just do not close the program but minimize it to tray, that way no new start-up is necessary and need jobs can still be added to the command queue . Very nice program, it runs very well and makes nice captures! Any chance of making it multi-threaded so it can utilize more cores? Any chance of the first image in the screen shot being a double-sized image, it helps when viewing the thumbnails in thumbnail mode to see what the video is about. KaFu, thank you for amazing tool, and 8.0 update! You’re welcome, glad you like it :)! I like version 8 because it solved one of my two issues : with version 8, the 1st movie from a directory generates correct ScreenCaps, so this is fixed thanks ! Why doesn’t it open in E:\movies\holidays 2015\family\ ? Anyway, it’s not really important as we don’t spend our time creating ScreenCaps from a single movie repeatedly. Thanks for this unique program and have a great year 2016 ! Hi, started using your program. I can make videopreviews without much effort, but making single screenshots seems to elude me. I see some little monitor popping up next to the program, but have no clue what to do next. Which steps should I take aside from selecting “Create Single Frame Screencaps” if I just want a screenshot of a frame say 10 secs into a movie? The “Create Single Frame Screencaps” function needs your interaction, see in the help file on the “About” tab on hotkey explanation. Fantastic program discovered 2 days ago, thx Kafu ! AMT version 7.0 works fine, with 2 more recent binaries installed (Mplayer & Mediainfo) so H264 codec can be processed. Is there a reason for updating the 2 other binaries (Sqlite from 3.8.6 to 3.9.2 and ImageMagick from 6.8.8-10 to 6.9.2-10) I didn’t dare to update those last two. 2) Directory paths aren’t correctly remembered : when I clic on “Create Screencap from a single movie” the program should remember the directory from where i select a movie to process, so next times I’ll clic again on “Create Screencap from a single movie” the directory should be opened immediately (if it exists) without having to browse again thru several directories to pick another movie from the same directory. Thanks a lot for the “Export/Import Settings”, it’s very helpful and bravo Kafu for this amazing program ! Sorry for the late reply, xmas season and I was preparing the new release. Glad you like it and thanks for the detailed feedback :). The issues you’ve mentioned should be fixed in v8. Like you did, the most worthwhile binaries to update are MPlayer and MediaInfo (to reflect codec development etc.). SQLite and ImageMagick are mature and of less importance to the whole process, so it shouldn’t be necessary to update these. Yep, still tinkering. But close to final, all new ideas should now go into v9. I hope I’ll manage to release it later this month. But why good is the timer feature then, if it keeps doing the same files over and over and over and over and over again? Could be a simple tick box and a browse button for the done folder imho. It’s meant to run in loops on a download folder, so that when downloads are finished the screencaps are created instantly. Can you implement a feature where AMT can move the processed video file to a ‘done’ folder outside the processing folder, so that the timer function becomes more effective by any chance? Right now, when the timer is on, the file will be reprocessed endlessly. And perhaps add png compression to the ‘Grab screenshots only’ feature so that processing a load of video won’t take up that much space. Thanks for the great tool so far, it has been of great help. v8 should be ready for release within the next month or so. PNG encoding for all pictures is one of the new features.The feature to move files with AMT I want to decline, as I want to keep AMT as non invasive as possible. Your tool doesn’t proceed H264/HEVC coded movies. Could you please fix it? Most likely that’s not an issue of AMT, but of the underlying MPlayer version. Try to update it manually, download the most recent MPlayer version from here http://mplayerwin.sourceforge.net/ ,rename MPlayer.exe to AMT-MPlayer.exe and point AMT to the new exe (Settings > Locate Executables)… or wait for the upcoming v8 of AMT :). Hello! Your tool is amazing and it has made my life 100% easier. Only a small problem I’ve come across. As of late my screencaps come out upside down. It didn’t happen before, but now it seems to happen with every file I try to screencap. Glad you like it :). Not sure what might cause this behavior, never happened to me. Did you alter the MPlayer settings manually? Did you try a re-install? Hi man, first of all thank you so much for your work, this treasure program saved my day. It works great, but I would like to get rid of timestamp text, is this possible? Glad you like it :). To disable the timestamp go to the “Layout” tab and uncheck “Add timestamps with Gravity” on the right side. Is there a tutorial in pdf format that I can download to read? Also I tried making some screen shots of the movie Catching Fire from my DVD but it did not work. How do I get it to work. I have Windows 7 64 bit and use Media Player or Quicktime to view my movies. no, there is no tutorial, you’ll just have to go trial&error and for most functions I’ve added tooltips with explanations. A separate documentation would definitely be useful, but as this is my hobby and really takes some time, I concentrate on the code and functionality :). Also be advised that AMT only works for movie files, sadly not for DVD and BD discs. These movie formats are quite complex and my current point of view is not to implement them, maybe that will change later on. Your tool is awesome, can’t wait for further developement, keep it up! how to create only one screenshot per file? I tried with almost all possible settings but It seems like it don’t work, somehow it don’t accepts my settings. there are two possible ways to do this. Either check the “Create Single Frame Screenshots” on the “Input” tab and select “Auto-Create Previewcaps” or go to the “Layout” tab, select and delete all entries in the pattern listview and enter 1 and 1 in the remaining “Else” case. I just found out you made a new version, many thanks for that. I use this awesome program with a lot of pleasure. I’ve got one wish for a future update, if possible. Resizable or a full screen mode. The reason is that I use a deep nested structure of the movies, or with long directory names and in the input tab but also in the progress tab it is difficult to see the full movie and directory names. It is just a wish so no need to do hurry or put to much effort in it. Thanks for this very nice software. By the way I’m also going to use your SMF. of course I remember our discussion about SMF, glad you still like it :). Regarding the AMT main window to be resizable, here’s the most recent Beta executable, give it a try (just replace AMT.exe in the program files directory / maybe rename the original file first instead of deleting it). In this version I also use BMP for temporary picture files, but it’s not yet implemented in all “Processing Modes” (see “Settings” tab), currently only Processing Mode “1)” will work as expected… still much to do for a final v8. I’d like to say that I love what you’ve done so far with AMT, especially the range of options. But I’d like to point out some problems in how it handles the temp JPG and PNG files to help you improve the quality of its output files. – Create PNG screenshots from video. !- Create _ts.jpg files (with timestamp) at quality 10. !- Create montage of quality-10 _ts frames without header, recompress as quality-10 JPG. – Add mediainfo JPG to quality-10 montage of quality-10 frames, save as quality-10 JPG. By the end, we’ve actually compressed the same image to JPG 4 times and the quality is much worse than necessary. Even when using a higher JPG quality, the timestamp text is still compressed 3 times (I think), and is noticably worse-quality than necessary. More worryingly, I chose PNG as the output (and left the quality at 10 – PNGs are lossless, so the “quality” setting should be irrelevant, right? ), and noticed that the timestamped frames are still saved as a quality-10 JPG. So the end result is a big PNG montage of JPG-quality frames. I propose using PNGs (or BMPs, for speed) for all the temp files, especially the timestamped frames, until creating the final file (montage with mediainfo), at which point it will be compressed to the chosen format (JPG or PNG). In that case, the “quality” option could be disabled if PNG is the chosen output format. This sounds like I’m complaining a lot, but I actually really like AMT, and if only it would avoid lossy compression entirely when the output format is PNG, its output would be perfect in my opinion. thanks for this excellent response, all points taken. I just didn’t thought about all the implications selecting the picture format to use for pre-processing. I’m already changing the relevant parts, it should not be to hard to use BMP or PNG for the internal processes, in fact I already have a working Alpha version. Indeed the overall picture quality is better without reduced compression. I have to work this out in more detail, as for the different processing modes the final pictures are produced at different steps, and of course the final ones still need to be processed to the final output format. Visit again in some days, I’m sure I’ll post a public Beta soon. Here’s the most recent Beta executable, give it a try (just replace AMT.exe in the program files directory / maybe rename the original file first instead of deleting it). In this version I use BMP for temporary picture files, but it’s not yet implemented in all “Processing Modes” (see “Settings” tab), currently only Processing Mode “1)” will work as expected… still much to do for a final v8. Testing v7 Beta, the file get deleted if it already exists in the folder, even with “add digits to filename”. PS : It would be great to have save/load patterns options and/or save/load config option as update installation deletes thoses parameters. Should be fixed in the upcoming v7 🙂 . Give this Beta (AMT-Installer_v7-Beta.exe) a try and let me know what you think. Works like a charm KaFu. I think there could be also one more important feature in your tool. Ain’t sure if it is not limited by mplayer or imagemagick but always worth a try. Thank you one more time. Good to hear it works fine for you 🙂 . What your asking for is currently not possible in a single run, but easily achievable in two runs. 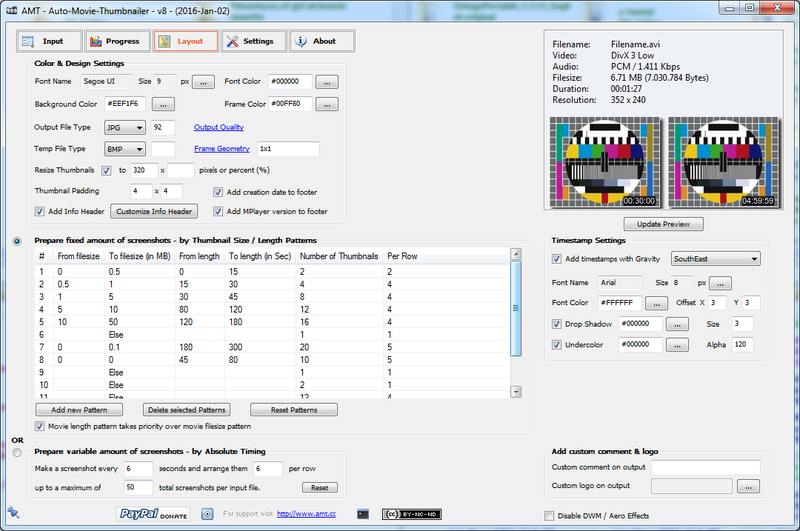 First create videosheet with standard settings (Processing Mode = 1), then initiate a second run with Processing Mode set to 4 (“Settings” tab) and uncheck “Resize Thumbnails” and “Add timestamps with Gravity” on the “Layout” tab. Could you please introduce drag&drop interface support for your awesome tool? So we don’t have to pickup folder/movies individually from list etc. Already implemented in the upcoming v7 🙂 . Give this Beta (AMT-Installer_v7-Beta.exe) a try and let me know what you think. Try the new feature by checking “Show AMT Drag & Drop Interface” on the “Input” tab (lower right). Thank you for the tip KaFu, awesome tools! Glad you like em 🙂 ! I got one question, is there an option to create/export *.txt output from “info header” like codec, resolution, file name etc. so we can easily copy and post video details? Amazing software, I had been using MTN old script but atm it doesn’t support 4K videos. There’s only one software that can compete with your tool but it’s shareware. Thank you a lot for developing it! Thanks for the positive feedback :). Version 7 is currently in the pipeline, hope to release it sometimes soon, but I’m quite busy at the moment. For some reason the program is crashing whenever I try to use it for a wmv file. Any way I can do it without it crashing? Besides that, it works flawlessly so far. Hello, almost all of my movie thumbnails are broken (error something). It occurs only in batch mode – when I try to reprocess single (broken in batch mode) file everything is ok. Why? thanks for this great tool. I’ve one question: Is it possible to choose a fixed output file name e.g. ‘fanart.jpg’? I need it for my XBMC setup with a single movie file in one directory. sorry for the late reply, and thanks for this request! Implemented in v6, give it a try :). I don’t know if that is a bug or something wrong with my codec settings or so. if It it was a bug pls fix it as soon as possible, if not pls provide me with right settings. thanks for reporting this, it was definitely a bug. I hope v6 now fixes this, give it a try :)! Hey, thanks for this super-useful tool! Could you please add support for (DVD) ISO files? Personally, it would save me tons of time, because I have a huge collection of DVD ISOs. Thanks again! – layout editor: if i choose “prepare variable amount of screenshots and set it to like every 15 sec and take 6 screens. it does 6 screen but not every 15 secs but the whole file. but i want spoilerfree thumbnails and screencaps. otherwise best of these tools! yes, I can confirm these two bugs, thanks for reporting! Will fix that in the soon to come v6.